I'm a lot closer to My First system..
For a Starter I'm Going All out.. I'm going to get a http://www.clarktanks.com.au/files/1913 ... For my tank..
A nice compact tank to fit in the area I have for it..
- Tank Ordered and at a Great Price.. It shall be partially buried to help keep the water temp Stable.. it shall be about 1m buried in the ground.. 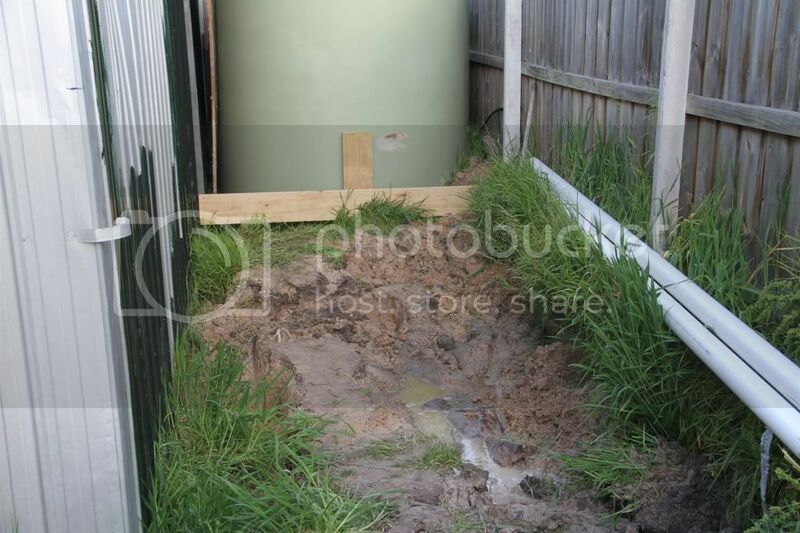 Description of the Tank Area..
A section Behind the Garage about 2.1m wide and about 6m long.. 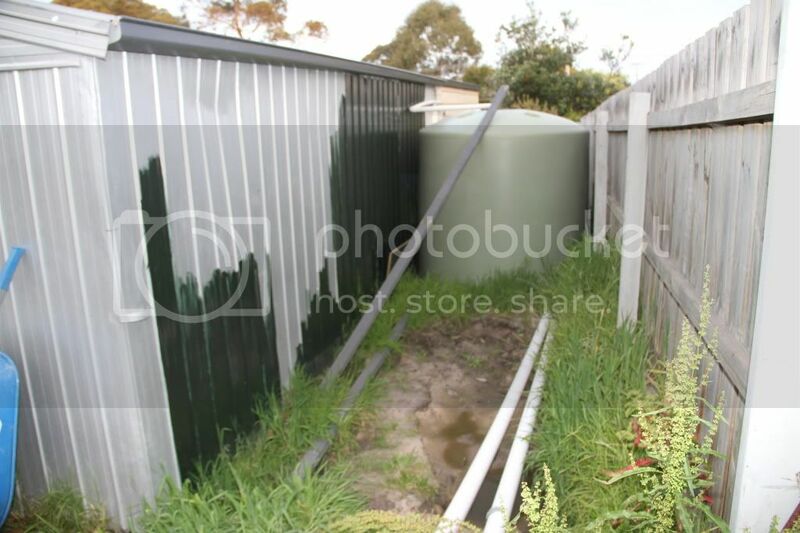 In this area will be the Tank, Settlement Chamber.. 2 Filter Barrels and 1 1200lt IBC with water for Topping up the fish pond with nice Prepared water.. Stable pH and No chlorine.. The Area for the Tank and Filter system.. The Area Where the first set of Grow Beds Will Go..
As you can see I have started the earthworks and the retaining wall shall be done by the time I have the tank to Place.. The Corner Area Where the 3rd Grow bed Will Go Plus the Sump..
And now on with the story..
Pond..> Settlement chamber > Pump > Split to A- Moving Media :B - Sand and Gravel Filter.. Return Back to the Pond..
To get the most of the Solids Out of the water column I plan to use a IBC as a Settlement chamber.. 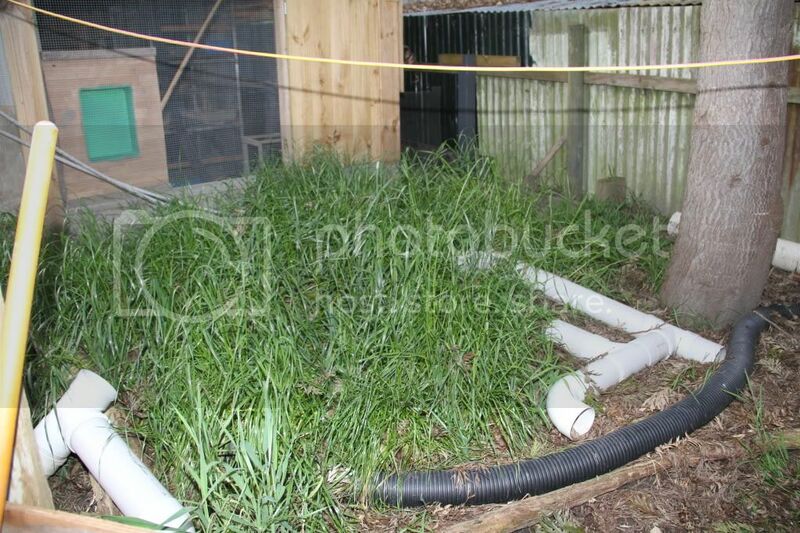 I'll Post some Link to What I mean for Moving Bed and Sand and Gravel Filter..
For a Pump I plan on using a Sequence 8,000 or a 12,000.. http://www.absolute-koi.com/subcat429.html .. I have to work out what flow I need to have thru all the system.. I might need to have a Second Pump to return the water from the sump back to the Pond.. The second pump shall only operate when there is enough water to warrant the return flow..
For the Grow-bed Component of the system, I'm Planing on having a Diversion Valve which will Direct Part of the Flow from the Main Stay Filter thru to the Bed's.. The Grow Beds I'm buying.. They are being delivered the same time as the Tank.. About 800lts volume.. I have 3 of them for start.. And Will also rig a few Pot's to handle a few smaller plants and 2 pots dedicated to grow a few plants Like Mint and such..
Also at a great Price..
With such a large tank, I plan to have divider in the tank to help move the fish to one end so they can be harvested..
At the Moment I'm Working on Earth works Which include A few retaining Walls, the retaining walls are to protect the garage and to give me some nice lvl working area.. Digging the hole for the Tank.. Some People will ask Why so Big a Tank..
1. Main reason For future expansion..
At this stage I will have 2 - 3 Grow Beds off this Tank..
A few heirloom apple Tree's on a Drip system's..
2. I want to have Trout in the Future..
Once I have the system Up and Running I will do an initial Fish-less start and also seed the moving media with a few Litres of Currently seeded K1 media.. from my fish pond..
My Current Pond system.. This shall be used as an Isolation/fry tank and also bacteria seed Source for my Filtration.. 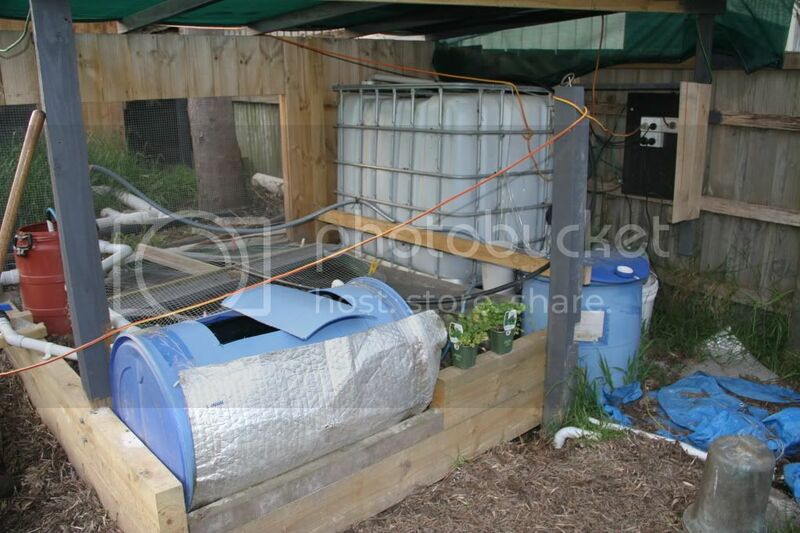 The IBC you see in Picture is Where I pre-condition the water I use for Pond water changes.. This is Where the Ferrets Play..
On a Side Note.. 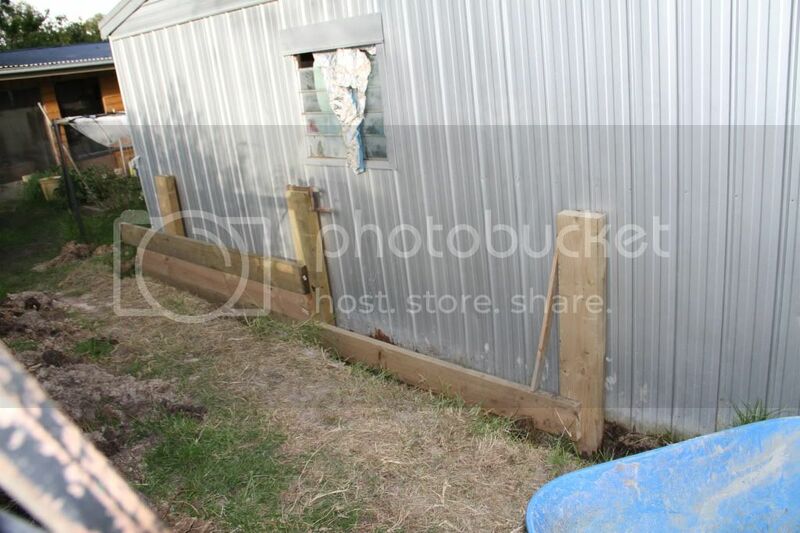 Does anyone in Melbourne know where I can get a Pallet of Hydroton for the Grow bed's.. I'm Look for a Good Cost.. anywhere from $26-$30 per bag..
Have you searched eBay? I found some on there for a great price, but freight to WA is a killer. Checked Ebay But the same.. I was wondering if anyone from Vic has a supplier..
Psst also any thought's or Idea's would be welcome..
Price: AU $12.00 (buy it now). Thats the Nutrifield stuff though, cheap Chinese clay.. I've heard average - poor reports on it from many different people. Thats a pretty ritzy pump there, a lot of money to be spending considering thats pounds prices, I'm imagining that it may be expensive.. OK not so bad, about $400..
For the cost of Importing from UK it is much cheaper than getting the same pump from Oz..about 1/2 the costs.. I like that Pump as it pumps 12,000lt for only about cost of running a 100w lamp so about 2.4kwh per day. about $0.57 per day.. Not bad..
Due to the way I want to run the system at the start I need to run a second Pump on a "on-demand system" to return water from the Grow Bed's..
Over all I'm Looking at running the whole system for less than 150w/hr.. So the Nutrifield stuff is Chinese made.. I'll have to see if I can source a Better Product.. for a Good Price..
Where the fish tank is going, on the left hand side Closest to the garage.. 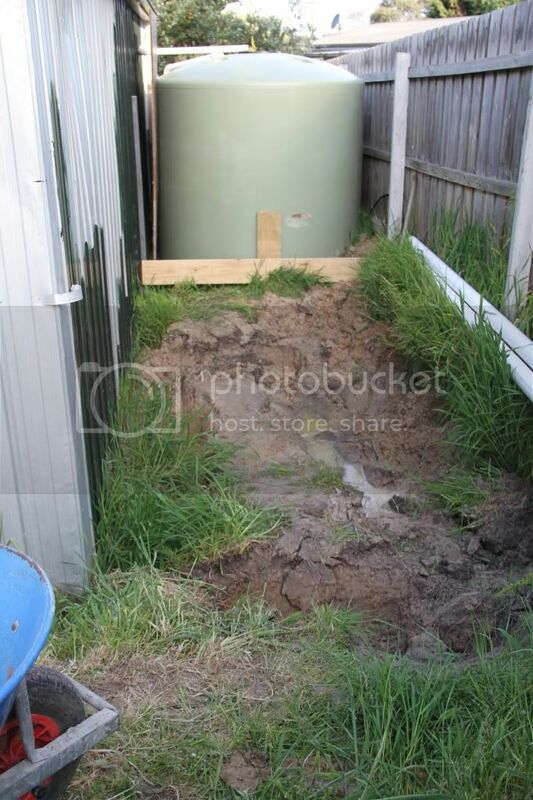 The level of the ground shall be raised to about 60cm's in this Area.. the first sleeper you see is the start of the retaining wall to..
- Where the tank is going I need to Dig down 60cm for the tank.. and then a further 10cm to Place a Base under the tank.. I need to move about 3cubic metres of Sand and Clay from the Area so I can Place the Tank..
going to be Fun.. All by Hand and the Last 35cm down are going to be hell.. Then to Dig in a few Post and a Retaining wall..
Ok I got some Great new..
1 - I can get the Hydroton for $30 per bag of 50lt..
and they have about 10-14 bags in stock at the moment.. So I'll Pick up what I can during the Week.. Yes the stuff I'm getting is the good German made stuff, so I should have about 40-50 bags on hand When I get the system up and running.. I think I will need enough to do 2400lt of Grow bed.. 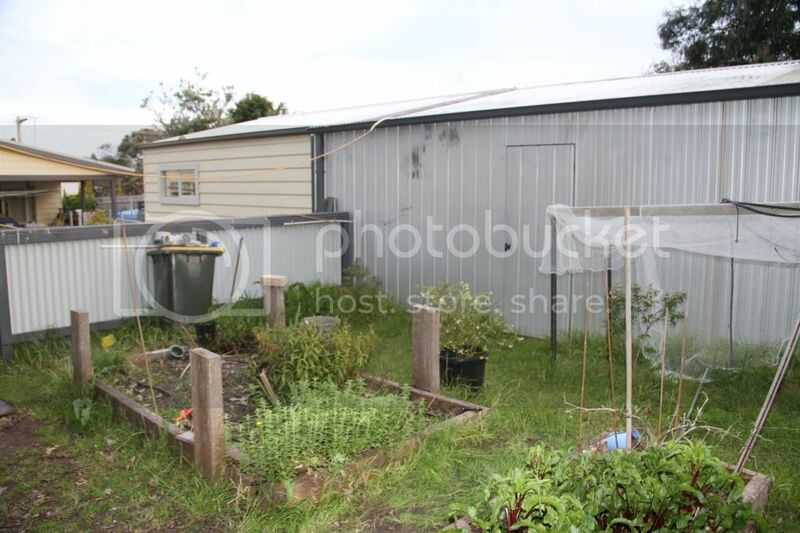 But I might be about 50-100mm short from the top.. Grow beds are about 500mm deep..
Just did a calculation think If I get 40 bags I will be Short so Might just punt a few centimetres of pea gravel in the Bottom..
2 - Need some advice on the levels I will need for the tank..
Back ground.. of the filtration.. Path 3 > Grow Beds > Sump > Return to main Fish tank..
Ok the Sand and Gravel Filter is Made up of several different Layer's..
| X>>|>> Waste Water out here..
Ok with the Sand and gravel Filter you need to pump the water into the bottom section of the Filter and Allow it to Trickle/Flow up to the top..
- I use Chicken Grit as my last layer to help stabilise the pond pH..
- to Clean the sand and gravel filter you apply air to the Air manifold in the bottom of the Filter and Divert all the Waste water out of the Waste water Line.. In Most cases the waste water Line is Below the normal Water outlet and is Capped off in normal Operation.. The Question Being is how Can I reduce the number of Pumps I need..
- Do I drop the Fish Tank to Below the level of the grow Bed's..? - Or Do I change the configuration of the system..
Another thing I have a Problem with is Ground Water.. 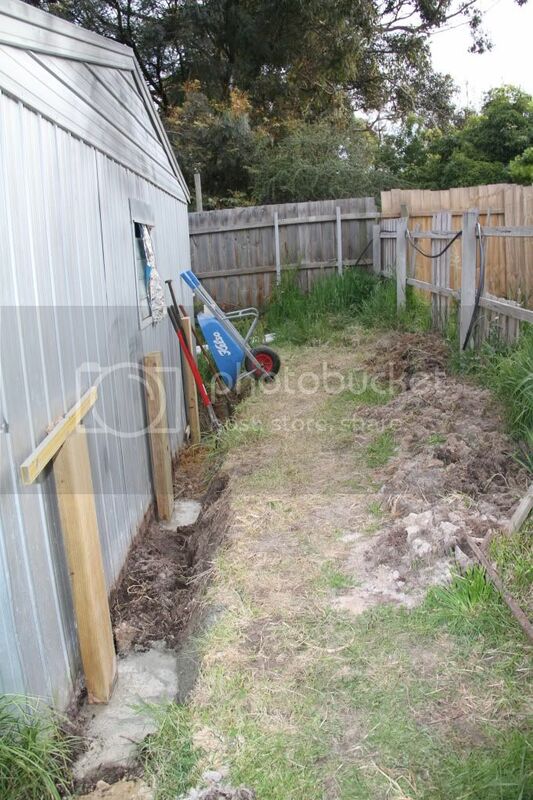 I'm installing a Sump French drain to help clear out the water..
Can anyone give me some idea's.. I Pick up 4 Food Grade IBC's for a Great Price.. they have 2more But I think I will be Pushing it Getting 4 on My 7x5 Trailer tomorrow.. They contained Sucrose for Baby food industry..
A very Lucky find for me..
Price I will post when I cost my Whole system Later..
Psst will Post a Few More Pic's of the Earth Works Progress and maybe evena Rough mud Map of the System Design..
what it is you are trying to do? If you're using 100 litres of K1 you don't need gravel growbeds use floating raft instead. If you have a settlement tank and a K1 tank that should polish your water up (especially if you put the dunny brushes in the settlement tank). This way everyone on the forum will know how good each type of filter is. No system should require more than one pump especially if you have a pick and shovel. I had a Discussion with the other Person in the House..
and I think we have resolved the most of the idea's..
One of the flows is.. Fish Tank > Settlement > Moving Media > Grow Beds [2 for now 3rd to be added after summer] >> Sump >> Pump Back to Fish Tank -- this could be Via a Sand and Gravel Filter.. I'm going to use a home-made Retro bottom drain[SLO] to get water into the Settlement Chamber..
Why are you so determined to remove all the solids from the system... before the grow beds??? It all comes back to my start in having a fish pond and it is better to remove as much solids out of the water before it hits the main filter system.. It's what I have been taught from Fish ponds..
A settlement could also be a Buffer for the fish to make sure they don't end up in a Grow-bed or even the pipe work..